Whether you’re looking for external wall cladding or internal cladding, Aerostone’s portfolio of fiber cement cladding has something to suit your application and budget. If you have a style in mind and can’t find what you’re looking for here, please please get in touch with our team. Cladding is used to build out a wall face and creates depth by leaving deep grooves or patterns imprinted into the wall. Cladding systems like ours can be used in a similar fashion to base thickening, but may or may not continue down to ground level. Plus, because it’s made using Hebel – a high-performance building material – you’ll enjoy greater energy efficiency, faster install & construction times and the peace of mind knowing you’re using an eco-friendly building alternative. Less Noise: When considering architectural cladding systems, Aerostone leads the way in terms of combining aesthetics and performance. Our wall cladding is made from Hebel, which offers excellent acoustic performance, helping to reduce and even eliminate outside noise sources such as traffic, air traffic and more. Improved thermal properties: Because of the unique composition of our cladding materials, homes can expect less reliance on heating and cooling. Fast to install: Aerostone’s external wall cladding is pre-fabricated therefore reducing install times onsite and is available in a range of finishes, colours, and patterns. Most building materials that are exposed to the elements suffer at least some form of degeneration. Our Hebel-based wall cladding is not only easy to maintain, but feels just as solid as other building alternatives and provides an excellent quality, long-term investment. Because of our dry summers, Australia has some of the most bush-fire prone areas in the world. With this in mind, Aerostone is proud to manufacture and supply a full selection of non-combustible interior & exterior cladding. Made using Hebel, Aerostone products offer builders a product that boasts excellent fire resistance. Made using CSIRO tested is proven to achieve Fire Resistance Levels (FRLs) of 60 minutes through to 240 minutes. There are many advantages to using aerated concrete architectural cladding over similarly priced alternatives. Value for Money: Because it’s made from hard-wearing aerated concrete, it lasts longer than other products which means less maintenance and better value for your home. 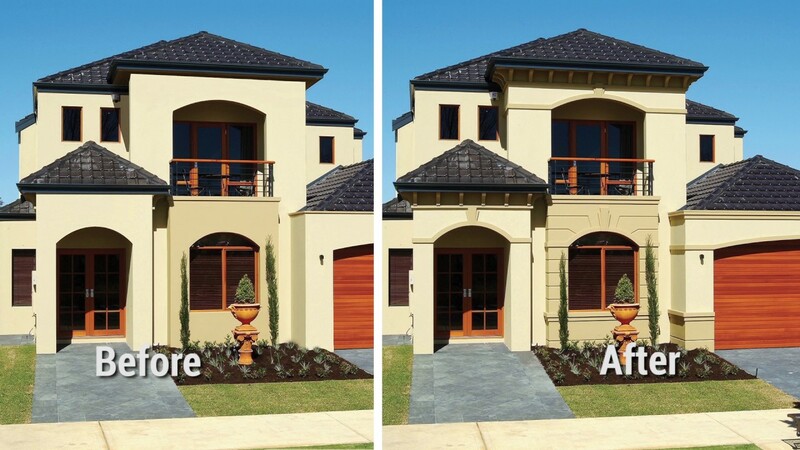 Durable: By choosing Hebel, you’re getting a 7-year warranty on all products as standard. Fast turnaround: Using an exclusive machine, we’re able to shape and supply wall cladding within industry-leading times. For more details on our architectural cladding solutions or to learn about our manufacture and supply times, be sure to get in touch with our team today.